Light streams through the north chancel aisle window in Bryn Athyn Cathedral, bathing the sandstone wall in a rainbow of colors. Photograph courtesy of Hal Conroy. Medieval Gothic architecture, with its vaulted ceilings and soaring walls filled with stained glass windows, originated just outside of Paris with the rebuilding of the Abbey Church of St. Denis (1137-1144). Abbot Suger, who developed an ambitious plan for the church’s windows, desired to give the people attending services at St. Denis a foretaste of the celestial light of heaven. Some eight hundred years later, Raymond Pitcairn became determined to reproduce the beautiful effects of this light for Bryn Athyn Cathedral. His quest to do so lasted more than three decades. Figure 1: This reproduction of a stained glass window in Chartres Cathedral, which depicts King Solomon, is located in the center of the north wall of Glencairn's Great Hall. It was made in the Bryn Athyn glass factory and studio. Stained glass windows had been an essential feature of medieval cathedrals since the beginning of the twelfth century. It was during this century that Abbot Suger (d. 1151), of the Abbey Church of St. Denis in France, had expounded his theory of “divine light.” Suger viewed the natural light streaming through the walls of colored glass as symbolic of heavenly light and a means to union with God. The impact of this light, he believed, was dependent on the quality of the stained glass windows. Unfortunately for Raymond Pitcairn, the arcane chemical formulas and hand-blown techniques used by medieval glassmakers were unknown in the glass factories of industrialized America. Dissatisfied with the quality of commercial stained glass, in 1915 Pitcairn hired local artisans to experiment with re-melting commercial glass over a bed of sand and pebbles. By doing so, he hoped to recreate the irregular textures that give medieval glass so much of its beauty. These experiments were a failure, but these humble early attempts to imitate the special qualities of medieval glass marked the beginning of a quest that lasted for the next 30 years. Figure 2: This window was made in the Bryn Athyn stained glass factory and studio for the west portal of Bryn Athyn Cathedral. From left to right, the biblical characters represented in the center panels are Adam, Noah, the Woman Clothed with the Sun (Book of Revelation 12:1), John the Evangelist and Aaron. Photograph courtesy of Hal Conroy. Early in the work of preparing for Bryn Athyn Cathedral’s stained glass windows, Raymond Pitcairn enlisted the help of Winfred Sumner Hyatt (1891-1959), a young art student. Hyatt had been born in Toronto, Canada, to a New Church (Swedenborgian) minister and his wife. He came to Bryn Athyn as a student, and went on to study at the Pennsylvania Academy of the Fine Arts in Philadelphia, winning two Cresson Traveling Scholarships. These scholarships enabled him to study art in Europe. Figure 3: Winfred S. Hyatt was the preeminent stained glass artist for Bryn Athyn Cathedral and Glencairn, designing and painting the majority of the windows in these buildings. Even as he pursued his studies, Hyatt was chosen to be a member of Bryn Athyn Cathedral’s symbolism committee. The committee, which included both clergy and laymen, was charged with selecting the subject matter for the Cathedral’s stained glass windows and sculptures. Their goal was to convey New Church ideas using a distinctive symbolic program. Hyatt, who maintained a strong interest in the teachings of the New Church, was well suited to the work of this committee. Figure 4: Glencairn’s chapel includes a stained glass window with three scenes from the Easter story, designed by Winfred Hyatt. The bottom panel depicts an angel sitting on a stone beside the open door of the tomb where the body of Jesus had been laid. Hyatt began taking trips to New York and other American cities with Raymond Pitcairn, in order to evaluate the stained glass windows in a variety of churches. In the summer of 1914, the symbolism committee commissioned Hyatt to travel abroad and study medieval stained glass windows in England and France. He sent back photographs and sketches of windows, and studied their color palettes. During later trips to Europe, he also purchased medieval stained glass panels and relevant books on Pitcairn’s behalf. By 1916 Raymond Pitcairn had placed Winfred Hyatt in charge of the stained glass studio in Bryn Athyn. He became the preeminent stained glass artist for Bryn Athyn Cathedral, and later Glencairn, designing and painting the majority of the windows in these buildings. Hyatt continued in this capacity until his death in 1959. Figure 5: The north wall of Glencairn’s Great Hall, as seen from the Upper Hall. Six lancet windows were made in Bryn Athyn for the Great Hall, based on medieval originals in Chartres Cathedral (in the town of Chartres, some 60 miles southwest of Paris). Figure 6: From left to right, Rowley Murphy, Paul Froelich, John Larson, Lawrence B. Saint, Raymond Pitcairn, and Winfred S. Hyatt stand in front of Cairnwood’s garden house, which was used as a stained glass studio. Murphy, Froelich, Saint and Hyatt were employed as stained glass artists. Larson managed the glass factory for the first few years of its operation. In 1916 Pitcairn met John A. Larson, who had set up his own glass factory in Brooklyn, New York. Larson, a Swedish immigrant, was descended from a family of master glassblowers. Pitcairn hired Larson to conduct experiments in replicating medieval glassmaking techniques. Larson visited medieval stained glass collections in New York City to study the colors achieved by the medieval glassmakers, and began producing his own small batches of stained glass in various colors. Pitcairn’s small but growing collection of medieval glass, stored in Cairnwood, his Bryn Athyn home, was also used for comparison. Larson kept careful records of these experiments and developed a significant body of color formulas. In 1921 Pitcairn made national headlines when he purchased 23 panels of medieval stained glass from the renowned collection of Henry C. Lawrence at an auction in New York City. These panels were acquired as a source of information and inspiration for the growing number of artists and craftsmen Pitcairn was employing in his quest to rediscover the techniques of medieval glassmakers. As progress continued on the Cathedral, Pitcairn expanded his medieval glass purchases even further; in time his collection grew to include more than 260 panels. Figure 7: A Pitcairn PAA-1 Sport autogiro with one passenger flies over the Bryn Athyn glass factory (circled) and the old Academy of the New Church tennis courts. The Huntingdon Turnpike, the main thoroughfare, is clearly visible, as is the hay barn (top) for Cairnwood Farms. The glassworks made its first batch of glass on July 5, 1922, and was in continuous operation until April, 1942. In 1922 Raymond Pitcairn established a factory in Bryn Athyn for producing stained glass windows for Bryn Athyn Cathedral. In the 1930s his glassworks also produced stained glass for Glencairn, the castle-like home he built adjacent to Cairnwood. The factory was located on what is now called Tomlinson Road (see aerial photo, Figure 7). The glassworks operated continuously from July, 1922, until April, 1942, when it closed because of World War II. The building was torn down in 1952, but many of the tools and materials were preserved in an empty barn; they are now part of the collection of Glencairn Museum. All of the stained glass made for Bryn Athyn Cathedral and Glencairn were produced in the Bryn Athyn glass factory. Photographs and a blueprint plan of the factory still exist (Figures 8 and 9). It was a wooden building, 60 feet long by 32 feet wide. A small, attached metal shed provided a space for the setting of glass mosaics. The design and final assembly of stained glass windows took place just down the road from the factory in Cairnwood’s garden house (Figure 6), under the direction of Winfred S. Hyatt. Figure 8: David Smith, glassblower, stands in the doorway of the Bryn Athyn glass factory. Figure 9: Plan of the Bryn Athyn glass factory, from a blueprint. In 2006 Carl Gunther (son of Ariel Gunther) confirmed that it represents the actual layout of the factory. Figure 10: This lamp was given to Ariel Gunther after 50 years of service. Gunther (right) was in charge of constructing glass furnaces, the chemical composition of the glass batches, and the overall supervision of the factory. David Smith (left), the primary glassblower, came to Bryn Athyn in 1922. This lamp can be seen beside the reception desk at Bryn Athyn Cathedral. Figure 11: David Smith works at the glassblower’s bench. He emigrated from Sweden to the United States as a young man and, after working for a time as a glassblower in New York, came to Bryn Athyn in July, 1922. Smith stayed on at the factory until it closed 20 years later. He was 78 years old when he blew his last batch of Bryn Athyn glass on April 10, 1942. Figure 12: This scale watercolor design, adapted from a stained glass window in Chartres Cathedral in France, was used in the creation of the central lancet window in the north wall of Glencairn’s Great Hall. Figure 13: After the design of a window was finalized, the full-sized painted drawing, which included lead lines, was traced onto heavy brown paper. The tracing was then cut up into individual pieces with a special pair of shears that reduced the size of each piece to account for the width of the leads so the window would be the correct size when assembled. Figure 14: Each hand-blown panel produced in the Bryn Athyn factory was individual in tone and texture, making it possible for the artist to select the appropriate piece of glass as required by the design. Figure 15: Once the pieces of glass were cut, the Bryn Athyn artists carefully painted on the faces, hands, feet, and other details. The pieces were then fired in a small electric kiln, bonding the paint to the glass. 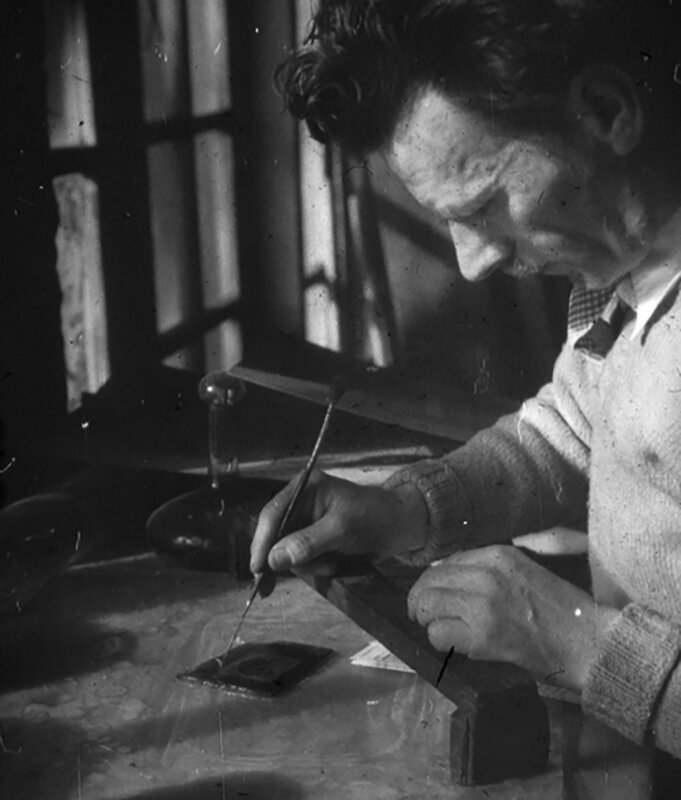 In this photograph, Albert E. Cullen paints a piece of glass using a “bridge” to steady his hand.